At 58 Loretta is just getting up to speed. “Lo” recently came in second in her age category for 100m and 200m sprints at the California Senior Games for the Senior Olympics and is headed to the finals! She is a certified Special Olympic Track and Field Coach with previous positions at LA Fitness, 24-Hour Fitness, and Club One Fitness Centers and has constructed fitness programs with the New York Female State Police, and US military. She is founder of OFAAFO Holistic and Fitness Programs ™ that conducts nutritional research, health and fitness programs, such as Dancin Tru’ Culcha: Intercultural Communication Through ‘Afro-Caribbean Dance’ and ‘OOO Girl Walk’n Programs. As an Asana Yoga Instructor “LO” has presented her unique style of “Chair Yoga” training. Lo is founder of Women of Concern Professionals & Strategic Conscious Networking, and Women of African Diaspora Griots. She created and produces Sumatra: The bold, strong & smooth blog talk radio show (www.blogtalkradio.com/Sumatra). Like all of our inspirational speakers Loretta has overcome obstacles such as the death of a daughter along with other challenges in life. She has met those challenges and found a place in running to push herself and strive toward the best with purpose, dedication, and commitment. Come and hear her story. 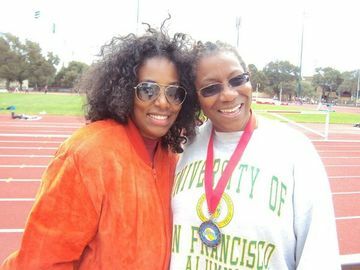 July 18, Walnut Creek – Loretta Green Williams, 58 qualified this year at Stanford for the National Senior Olympic Games in the 100m. We can’t let age hold us back! July 25, Piedmont – Rosalia Mariz, a traditional naturopath, originally from Tijuana, Mexico. Rosalia studied at UC Berkeley and at Trinity College of Natural Health.